Rebecca of Moontree Press is over at the Design*Sponge guest blog talking about The Handmade Wedding for the next two weeks. She’s got two posts up already and both are chock full of fantastic and creative ideas. Be sure to keep reading all week. Please also be sure to check out her own blog which showcases the amazing letterpress work she does. 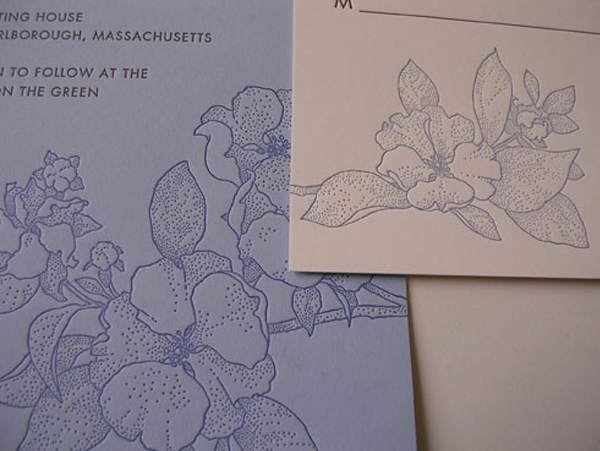 Blue on blue invitation, by Moon Tree Press. I love, love LOVE her ideas – especially the paintings colour-copied on Vellum paper. I might try that myself, and then frame them with Japanese paper. ooh! new Sunday project!